Jeff Urban, when he’s not racing with us, takes very cool photos. When he is racing with us, his wife Jen takes very cool photos. 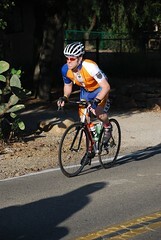 One of them took this one of me climbing to the top at Ojai last week. Please note: by the time this photo was taken, I was about a zillion miles behind the field. I was not working this hard to catch up; I was working this hard just to finish.